After breakfast, you will meet the gentle and friendly Baiga people, the indigenous forest tribe. Packed launch later visit the weekly market of baiga people at teragaon in the afternoon ( Baiga tribe is famous for the tattoo throughout their body) & overnight. In the morning drive to Kanker via Raipur and visit Raipur 's Mahant Ghasidas Museum before leaving for the former princley State of Kanker. Upon arrival at Kanker Palace/Hotel Lake view, the Maharaja's family will greet you and show you to your palatial rooms. After your breakfast at the Palace, the Bastar tribal experience begins. 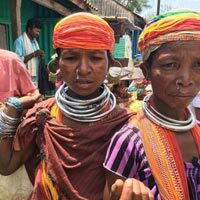 You will encounter here the special nature of North Bastar with a visit to a colorful weekly market. It gives you a great oportunity to meet the local people. At Kondagaon discover some of Bastar's finest handicrafts, and the people who make them. Lunch will be a picnic in the deep green sal forests. Experience Bastar's unique 'ghotul' dormitory system completes an unforgettable day. Later drive to Jagdalpur. Overnight in Hotel Naman Bastar. After breakfast, drive to visit of city. Morning tour of historical Jagdalpur and the Anthropological Museum is completed by a sunset idyll at the Chitrakote waterfal, Bastar's very own 'Niagara' on the Indravati River : you will also visit some of the local Bison - Horn Maria tribe, renowned for their spectacular ceremonical dancing. Evening back to Hotel. An early breakfast allows time for a visit to the rich forests of the Kanger Valley National Park , the enchanting Tirathgarh waterfall and the extraordinary stalactite and stalagmite caves. Kanger retains the original intensity of the forests that once covered this whole region, and you will find also forest tribal people in their natural habitat. Afternoon visit a weekly market at Pakhnar of Dhuruwa and Maria Gond Tribe inside a remote forest. Evening back to Hotel. 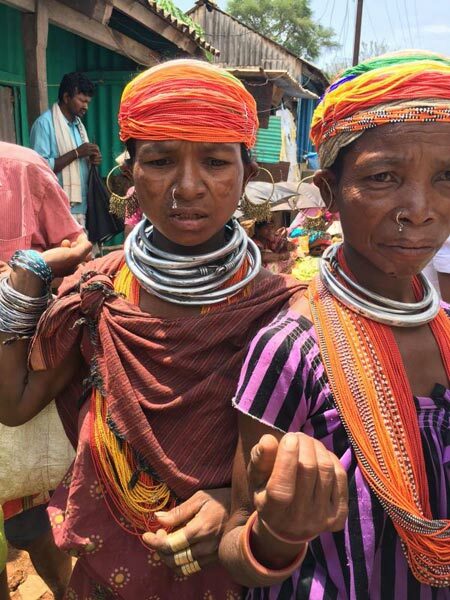 (Visit of After early breakfast proceed to Ankadelli - 70 km to witness the most traditional, interesting & unique tribal weekly market of the Bonda tribes. The place is the border of the neighboring state of Andhra Pradesh, divided by river Machkund, with interesting waterfall, mountain & forest. Free time in the market. Afternoon proceed to Lamtaput area to explore another traditional tribal community the Gdabas interact & experience the true rural village life Late afternoon drive back to Jeypore. After breakfast drive to Rayagada enroute visiting the largest weekly market of mali / rana & Paraja tribe & paroja tribal village Overnight at Rayagada, Hotel sai International. Morning drive to Konark the world heritage site where you will see fine specimen of kalingan school of architecture at sun temple & also temple is famous for a it’s intricate erotica sculpture and later drive to Nayakpatna the folk painting village where you will experience the palm leaf paintings. Afternoon have view of Jagannath temple from roof terrace. Overnight hotel. Optional : You can experience the traditional acrobatic dance form popularly known as Gotipua in village atmosphere which can be arranged with pre intimation. Early morning proceed to fisherman village to see the fishing activities on sea shore of Bay of Bengal & later drive to Bhubaneswar enroute visiting pipili famous for the appliqué work, 64 yogini temple at Hirapur ( tantric temple in the rural ambience) & dhauli ashokan rock edict. Overnight Bhubaneswar. Breakfast at hotel. Visit the ancient temple architecture with sand stone on the old part of the city includes parsurameswar/ mukteswar/ lingaraj/ bindusagar tank/ rajarani temple later visit the khandagiri & udaygiri caves. Later transfer to airport to connect the flight for onward destinations. COST : ONLY ON REQUEST.